Service Pack release bring new improvements to the operating system. Service Pack 1 for Windows 7 users have been released. Users can download the Service Pack 1 file for manual installation or perform automatic installation via Windows Update. 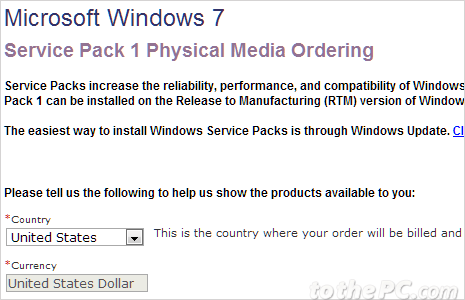 However, if you cannot download Service Pack 1 using either of method – you can order free Windows 7 Service Pack 1 DVD media from Microsoft using following procedure. 1. Open this webpage to place order for physical media DVD containing Service Pack 1 for Windows 7 operating system. 2. Select country for shipment of DVD media. Currently, you can only select USA or Canada. Then click Continue button. 3. Check the ordering cart webpage for correct language and number of DVDs you need for Windows 7 Service Pack 1. Click Add to Cart button and then click Checkout button at top right. 4. Then enter your shipping address and contact details including email address and phone number. 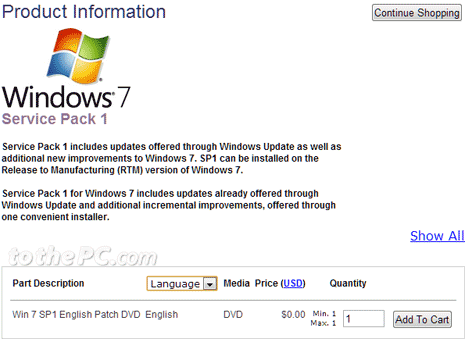 Please note: DVD media of Windows 7 Service Pack 1 is free of charge. However, whole process does involve shipping charges of about $6 for the delivery.